It is with deep sorrow that we inform our readers that beloved humanitarian, mother, and educator Armine Zambak has passed away. May her soul rest in peace. Armine Zambak was a woman who strived to strengthen Armenia and inspire its future generation of political leaders. She created the Armine and Garabed Zambak Scholarship Fund in 2010 in honor of her husband, the late Garabed Zambak, a successful entrepreneur and business leader in Istanbul who was especially dedicated to preserving Armenian heritage. After Garabed Zambak’s death in 1977, she continued his legacy. Like her husband, Mrs. Zambak believed strongly in furthering educational opportunities. Through this particular scholarship she hoped to strengthen Armenia’s future by providing support and greater opportunity for young Armenians with dreams of becoming strong and dedicated future leaders in politics, international relations and public administration. Each fall the program provides full scholarships to four outstanding graduate students at Armenian universities. “Now, I am not just another member of the civil service community. I will have to work very hard to serve my country,” said Tamara Ghalayan, one of the first recipients of the scholarship who is now working in Armenia’s Ministry of Finance. Mrs. Zambak shall remain a great role model to all young Armenians. She was born Armine Tahtalyan in Ankara in 1916, shortly after her father was taken during the genocide. Despite numerous hardships, she graduated at the top of her class from Uskudar American College in Istanbul and excelled as a top employee in a bank. She later supported her husband, in business and volunteer work, often serving as his translator. 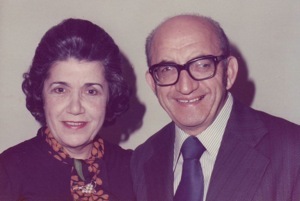 Following her move to the U.S. in 1984, Mrs. Zambak remained a devoted supporter of the Armenian community. When establishing the endowment fund in 2010 , Mrs. Zambak noted that “It is important that fresh, new approaches to leadership and progressive ideas in governance be brought to Armenia while honoring our precious culture and our people’s history.” Indeed, the Armine and Garabed Zambak Scholarship will continue to stimulate young Armenian students’ achievements through which they will benefit their communities for years to come.